Are you feeding your horse like a horse? Part 1 of 3. In the next three posts, I’d like to draw your attention to what we feed our equine partners, and how we feed it. In the first post, I will address how we feed our horses, given their eating practices when free-roaming (wild, feral, or unmanaged). In the second, I will touch on the nutritional content of domestic horse feed, again comparing common practices against what we know of horses’ nutrient needs. In the third, we’ll discuss options for feeding our captive horses, and how we might begin to meet some more of their biological needs. I hope somewhere in all of this you’ll find something to chew on – because a healthy horse is a happy horse, and that’s what we’re aiming for! I would like to state that I am not a certified equine nutritionist, a vet, or a medical professional of any kind, and that any information I present here is a matter of researched opinion only. I am very open to discussion, debate, and correction, and absolutely do not recommend that you take my word for gospel, or alter your feeding plans without doing your own reading and consulting a professional you trust. Part 1: Are you feeding your horse like a carnivore? It’s common practice to feed horses meals of hay and grain throughout the day, usually mimicking a human schedule of breakfast, lunch, and dinner, with maybe a late-night snack before bed. It’s handy – the horses get the “right” amount of food (if they aren’t losing or gaining weight, it would certainly appear this way), hay-use can be carefully tracked, and who doesn’t like that excited nickering when they arrive to feed? But do we ever wonder what the horse thinks about this process? Easy. They think we’re crazy. The digestive system of the horse is evolved to process a near-constant flow of indigestible fiber. 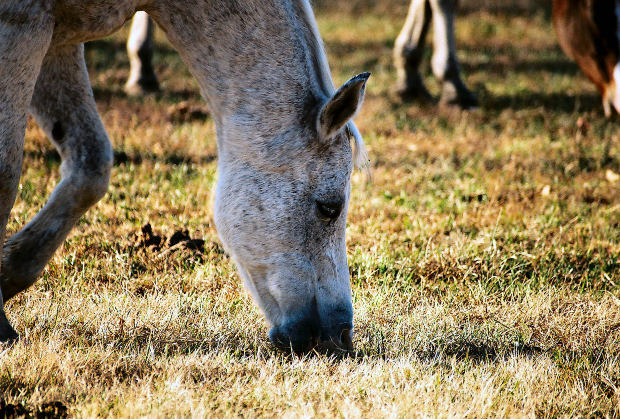 As grazing animals, horses in natural settings move slowly all day, seeking good sources of forage and nibbling all kinds of plant matter along the way. Wild horses spend between 13-18 hours a day eating, depending on availability and quality of forage. Digestion is nearly constant, moving fiber through the body until it reaches the hindgut, where it is fermented to produce the vast majority of the horse’s energy. Because nutrients can be sparse in many of the harsh environments horses thrive in, their bodies are adapted to absorb and use everything they can. This contrasts sharply with the eating habits of carnivorous or omniverous mammals, such as humans. With bodies designed to digest, process and store macronutrients (fat, protein, sugar), we are able to eat nutrient-dense portions or meals a few times a day, and essentially feed off those meals in between. When we feed our horses in a way that seems logical to us, given our own eating habits, we fail to acknowledge fundamental differences in biology. Consider this, even if it sounds dramatic: a horse eating a flake of hay four times a day thinks he is starving for the other 20 hours in that day. Each time he gets his feed, he bolts it down. This alone might cause stomach upset, but not nearly as much as the time between feedings, when his body is still producing digestive enzymes and stomach acid, without anything for them to act on. Though you might think your horse knows he will always be fed again (and maybe his brain does), his body is simply not adapted to find this sufficient. Food is a constant requirement, a necessity and a way of life for the horse. Restricted access to food – food which is often completely inappropriate (more on that in the next post) – creates a host of physical, mental and emotional issues for horses. Food aggression, cribbing, ulcers, obesity, lethargy, wood-chewing, pacing and weaving – this is just a random sample of common problems that can be traced back to unmet nutritional needs. This, of course, is only part of the puzzle. Click here for Part 2! Or click here for Part 3!